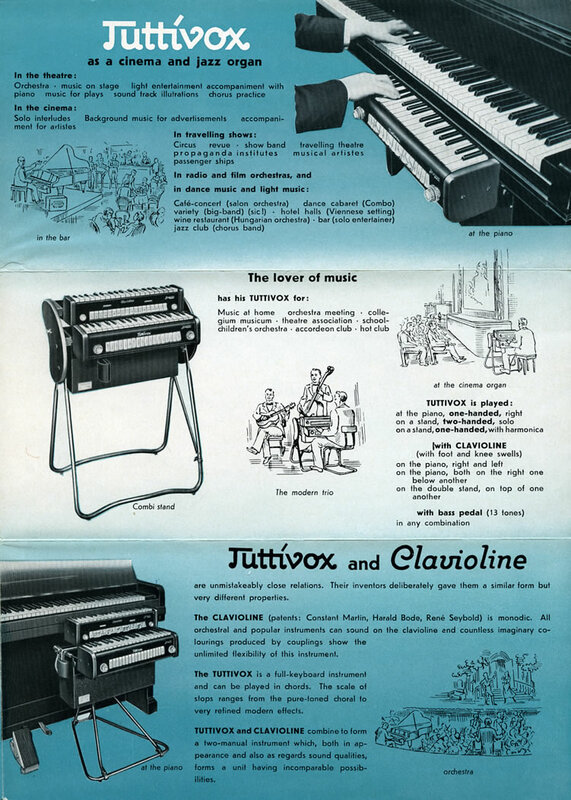 The Tuttivox was essentially a polyphonic German licensed version of Raymond Martin’s Clavioline, manufactured by the Danish company Jörgensen Electronics, in Düsseldorf, Germany . This updated Clavioline was created by the pioneering German engineer, Harald Bode. The Tuttivox was a small portable one keyboard, amplifier and speaker combination buitl into a wooden carrying case. the keyboard was usually played attached to a piano and intended for use with commercial dance and popular music bands of the day. the instrument created it’s sound using fourtyE- series valves; thirty six as audio oscillators with filtering provided by coils and capacitors. There are 3 foot positions available and 36 filter settings, which could be combined to enable a variety of tone colors. the Tuttivox remained in production until the 1960s. Bode, in collaboration with French instrument maker René Seybold, later developed an extended version of the Clavioline with an extra two octaves on the keyboard called the ‘Concert Clavioline’ and a combination of the Concert Clavioline and the Tuttivox was marketed as the ‘Combichord’ “The smallest church organ in the world”. (0:43). Bach played on one Clavioline and a Bode-Orgel by unknown players. Excerpt from a Jörgensen (Düsseldorf) promotional tape titled “6 Claviolines” produced for promotional purpose in 1952. (0:51). A chorale-like passage played by an ensemble of Joergensen Claviolines . (0:32). An ensemble of claviolines performing dance music with a range of orchestral sounds. From the Jörgensen (Düsseldorf) promotional tape, “6 Claviolines”. 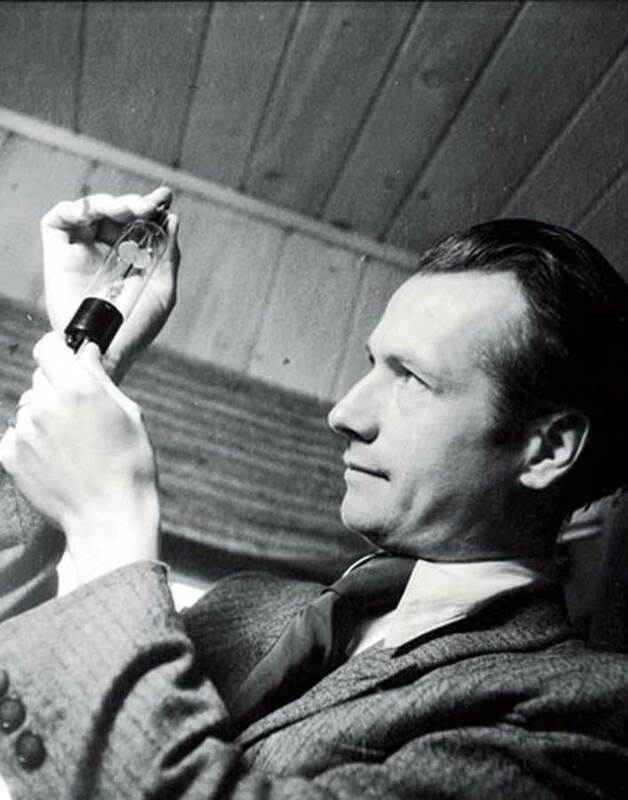 Harald Bode; October 19, 1909 Hamburg Germany – January 15, 1987 New York USA. Bode Studied mathematics, physics and natural philosophy at Hamburg University, graduating in 1934. In 1937, with funding support provided by the composer and band-leader, Christian Warnke, Bode produced his first instrument the ‘Warbo-Formant Orgel’ (‘Warbo’ being a combination of the names Warnke and Bode). Bode moved to Berlin in 1938 to complete a postgraduate course at the Heinrich Hertz Institute where he collaborated with Oskar Vierling and Fekko von Ompteda. During this period Bode developed the ‘Melodium’ ; a unique monophonic touch-sensitive, multi-timbral instrument used extensively in film scores of the period. When WWII started in 1939 Bode worked on military submarine sound and wireless communication projects “…We had the only choice in Germany, to go to military service or do work for the government. I praise myself lucky, that I was able to go to the electronic industry” and moved to the small village Neubeuern in southern Germany, where in 1947 Bode built the first European post-war electronic instrument, the ‘Melochord’. 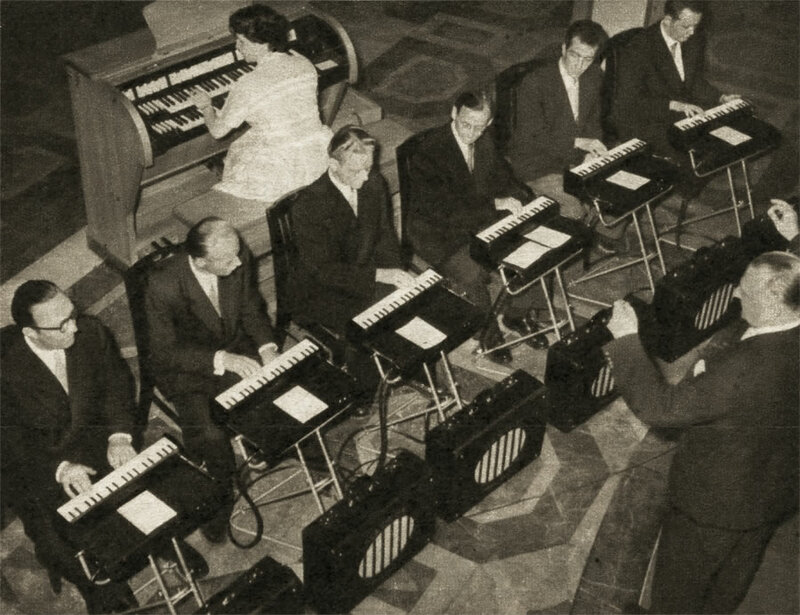 In 1949 Bode joined the AWB company where he created the ‘Polychord’ a simpler, polyphonic version of the ‘Melochord’ which was followed by the ‘Polychord III’ in 1951 and the ‘Bode Organ’, a commercial organ which became the prototype for the famous Estey Electronic Organ. After leaving AWB, Bode’s designs included the ‘Tuttivox’, a miniature electronic organ and collaborated on a version of Georges Jenny’s ‘Clavioline’, both big sellers throughout Europe. In 1954 Bode moved to the USA, settling in Brattleboro, Vermont where he lead the development team (and later, Vice President) at the Estey Organ Corporation. In 1958, while still working at Estey, Bode set up the Bode Electronics Company where in March 1960 he created another unique instrument; a modular synthesiser “A New Tool for the Exploration of Unknown Electronic Music Instrument Performances” known as the ‘Audio System Synthesiser’ which Robert Moog used as the basis for his line of new Moog synthesisers. After the Estey Organ Company foundered in 1960, Bode joined the Wurlitzer Organ Co and moved to Buffalo, New York where he was one of the first engineers to recognise the significance of transistor based technology in electronic music. Bode’s concepts of modular and miniature self-contained transistor based machines was taken up and developed in the early 1960’s by Robert Moog and Donald Buchla amongst others. 1962 saw the beginning of a long collaboration between Bode and the composer Vladimir Ussachevski at the Columbia Princeton Center for Electronic Music which lead to the development of innovative studio equipment designs such as the ‘Bode Ring Modulator’ and ‘Bode Frequency Shifter’. The commercial versions of these inventions were produced under the Bode Sound Co and under license Moog Synthesisers. Harald Bode retired in 1974 but continued to pursue his own research. In 1977 he created the ‘Bode Vocoder’ (licensed as the ‘Moog Vocoder’). In 1981 he developed his last instrument, the ‘Bode Barberpole Phaser’.